Backreaction: Stephen Hawking dies at 76. What was he famous for? Stephen Hawking dies at 76. What was he famous for? I woke up this morning to the sad news that Stephen Hawking has died. His 1988 book “A Brief History of Time” got me originally interested in physics, and I ended up writing both my diploma thesis and my PhD thesis about black holes. It is fair to say that without Hawking my life would have been an entirely different one. While Hawking became “officially famous” with “A Brief History of Time,” among physicists he was more renowned for the singularity theorems. In his 1960s work together with Roger Penrose, Hawking proved that singularities form under quite general conditions in General Relativity, and they developed a mathematical framework to determine when these conditions are met. Before Hawking and Penrose’s work, physicists had hoped that the singularities which appeared in certain solutions to General Relativity were mathematical curiosities of little relevance for physical reality. But the two showed that this was not so, that, to the very contrary, it’s hard to avoid singularities in General Relativity. Thanks to this seminal work, physicists understood that the singularities in General Relativity signal the theory's breakdown in regions of high energy-densities. 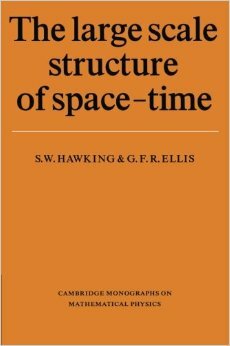 In 1973, together with George Ellis, Hawking published the book “The Large Scale Structure of Space-Time” in which they laid out the mathematical treatment in detail. Still today it’s one of the most relevant references in the field. A somewhat lesser known step in Hawking's career is that already in 1971 he wrote one of the first papers on the analysis of gravitational wave signals. In this paper together with Gary Gibbons, the authors proposed a simple yet path-leading way to extract signals from the background noise. Also Hawking’s – now famous – area theorem for black holes stemmed from this interest in gravitational waves, which is why the paper is titled “Gravitational Radiation from Colliding Black Holes.” This theorem shows that when two black hole horizons merge their total surface area can only increase. In that, the area of black hole horizons resembles the entropy of physical systems. Only a few years later, in 1974, Hawking published a seminal paper in which he demonstrates that black holes give off thermal radiation, now referred to as “Hawking radiation.” This evaporation of black holes results in the black hole information loss paradox which is still unsolved today. Hawking’s work demonstrated clearly that the combination of General Relativity with the quantum field theories of the standard model spells trouble. Like the singularity theorems, it’s a result that doesn’t merely indicate, but prove that we need a theory of quantum gravity in order to consistently describe nature. While the 1974 paper was predated by Bekenstein’s finding that black holes resemble thermodynamical systems, Hawking’s derivation was the starting point for countless later revelations. Thanks to it, physicists understand today that black holes are a melting pot for many different fields of physics – besides general relativity and quantum field theory, there is thermodynamics and statistical mechanics, and quantum information and quantum gravity. Let’s not forget astrophysics, and also mix in a good dose of philosophy. In 2017, “black hole physics” could be a subdiscipline in its own right – and maybe it should be. We owe much of this to Stephen Hawking. In the 1980s, Hawking worked with Jim Hartle on the no-boundary proposal according to which our universe started in a time-less state. It’s an appealing idea whose time hasn’t yet come, but I believe this might change within the next decade or so. After this, Hawking tried several times to solve the riddle of black hole information loss that he posed himself, alas, unsuccessfully. It seems that the paradox he helped create finally outlived him. Besides his scientific work, Hawking has been a master of science communication. In 1988, “A Brief History of Time” was a daring book about abstract ideas in a fringe area of theoretical physics. Hawking, to everybody’s surprise, proved that the public has an interest in esoteric problems like what happens if you fall into a black hole, what happed at the Big Bang, or whether god had any choice when he created the laws of nature. Since 1988, the popular science landscape has changed dramatically. There are more books about theoretical physics than ever before and they are more widely read than ever before. I believe that Stephen Hawking played a big role in encouraging other scientists to write about their own research for the public. It certainly was an inspiration for me. Good bye, Stephen, and thank you. He leaves a lasting legacy and left the world on pi day. "In the 1980s, Hawking worked with Jim Hartle on the no-boundary proposal according to which our universe started in a time-less state. It’s an appealing idea whose time hasn’t yet come"
More seriously: nice summary. I was interested in science long before A Brief History of Time came out, growing up with Isaac Asimov (who, by his own admission, was a terrible researcher (he was a biochemist) but a great explainer). I have to say that there are other popular-science books which cover a similar territory which do it better than Hawking's. 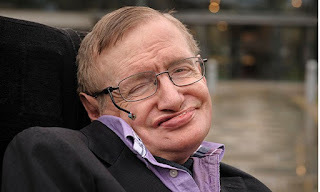 Among the general public, Hawking was famous for being famous. While he was serious about his work, he didn't take himself seriously, and, like Feynman, enjoyed life. This is a very sad day, the world loses a great mind. But his deep, penetrating analysis of problems in astrophysics will inspire this and future generations of physicists to try to solve the resulting paradoxes he brought to the fore. Sabine. Nice article. Some more. o Arguing that the universe has very special initial conditions which could explain the homogeneity and isotropy of universe. ... 1) How can Kerr black holes have large angular momenta? ... 2) Why do black hole mergers ring down within milliseconds when most of each mass must pass through the other's event horizon -- which externally viewed takes forever? ... 3) Where is the firewall? Where is the quantum yada-yada? ... 4) Why are merger binding energies merely -5% of combined masses? A black hole merger mimics [2D + epsilon] bubbles with no interior volumes, no singularities, nothing passing through event horizons, and no GR/QM interface. They touch, they pop into one bubble.
" the combination of General Relativity with the quantum field theories of the standard model spells trouble" No SUSY, no standard model, no problem. Observe vacuum being ~10^(-9) mirror asymmetric toward hadrons under ambient conditions (also damning much of M-theory). it could serve as a model for theoretical physics pedagogy. When the Grim Reaper came for Hawking over half a century ago, Hawking was too engrossed in his work to notice. The Reaper finally got tired of trying to get Hawking's attention, and decided to come back later. Alas, come back it eventually did. The way I understand it is that I think they ring up rather than down and that the result could be an object that spins virtually forever, so maybe in a sense the merging is never ending indeed. However, I also think that they together form a new event horizon that encloses both masses so the endresult of the merger cannot be observed. Therefore I think mutual penetration of event horizons is not an adequate description. Forgive me if I am being extremely naive and ignorant, but is it not true that L. Susskind solved the "black hole information loss problem" to which you refer here? In '88 I was a year away from graduating high school, a young man dealing with a neuromuscular disorder of my own (nothing so nefarious as ALS, but no picnic either), when Stephen Hawking's "A Brief History of Time" splashed the mainstream. As a new member of the Book of the Month Club, I got my copy post-haste. Since Sagan's episodes of "Cosmos" on PBS, I'd been deeply interested in the workings of stars, galaxies and other mysteries of the universe, but I didn’t see a path to a career in the field of physics for myself. But Hawking shone a light. Today, I am NOT a physicist. Although Hawking's writing always brilliantly made the concepts easy to digest, it provided me with the false belief that I actually understood the subject in depth. However, it turns out in physics there's quite a bit of math involved for which I just don’t have the patience. I packed up my telescope and took my degree in English Lit. But that I also credit to Stephen Hawking. One reason might be that the new horizon encloses both black holes when they touch. That is, before their individual horizons can merge. There's no mass passing through mass in a black hole merger - they are mostly empty. They settle down quickly because GR tells them to better be spherical and static. If the majority of (given event horizon accretion) black hole mass is its formation singularity, then merger creates a large uncentered moment. Singularities violently orbit their common center of mass in huge curvature spacetime. Bubble merger opens a portal? Physics knows the external radius of curvature of each black hole and that of the product black hole. Summed binding energy of each bubble less binding energy of the merged bubble is a few percent for similar radii. There are no singularities or anything to fall through, only [2D + epsilon] event horizons. GR is a complete description. I understand that Hawking's singularity theorems require a condition that gravity always attracts but never repels. But in the presence of dark energy, gravity is repulsive. So doesn't that mean that there need not be a Big Bang singularity and time can go back forever ? If so, then what is the relevance of the no-boundary proposal ? "I understand that Hawking's singularity theorems require a condition that gravity always attracts but never repels. So doesn't that mean that there need not be a Big Bang singularity and time can go back forever ?" It has been known for almost 100 years that cosmological models with a positive cosmological constant without a big bang exist. But these are ruled out observationally, most elegantly because they predict a maximum redshift which is smaller than some observed redshifts. So there is no way that classical cosmology can avoid a big bang, even with a cosmological constant. Because the cosmological constant is a constant, it can't be used to cook up violations of Hawking's conditions. A dynamical field that has a negative energy density to first order could, but that doesn't seem like what exists. Note that a positive cosmological constant has positive energy but negative pressure. Interestingly, if you read this quanta mag on information loss paradox , you will see that Hawking DID concede at one time that "he had lost the bet" and he admitted that information is NOT destroyed - as suggested by Susskind. However, as the article mentions, the puzzle was REOPENED in 2012 by further observations. And so, perhaps the best answer to he question "what is the nature of the paradox and was it solved?" is to say "its complicated" ala' the popular facebook relationship status. I don't know what makes you think that scientists declare cases settled based on what one or the other person wrote in a book or said to a magazine. Neither, for that matter, is betting an accepted mode of procedure. No one knows what happens with information that falls into a black hole. All we have are guesses with varying degrees of plausibility. Bee - In case you did not notice, your previous post has hit Hacker News and is the 2nd highest ranked link at this moment. I glanced at the links this morning and was like..wait..what I read that the other day! No I hadn't noticed, it's not a website I follow. Thanks for the warning! I suppose its not wrong for one to claim that the issue has had twists and turns just like other issues in science. I suppose its not wrong to state that main players concerned - including Stephen Hawking - have fluctuated in their views, changing from one position to the opposite and maybe back again. I didn't intend to suggest that books and bets are any substitute for clear reasoning and mathematical analysis. I made the mistake of thinking I knew much more than I actually *did* know. Please accept my thanks for guiding me towards the right direction. I have just read that his last paper was all about testing for the other universes. I think that the Borde-Vilenkin-Guth theorem answers your question because it says that a spacetime that is on the average expanding is past-geodesically incomplete. Oh dear. In yesterday's Sunday Times, journalist Bryan Appleyard claims that "The [BH] paper in effect launched the next four decades of cutting edge physics. Odd flowers with odd names bloomed in the garden of cosmic speculation – branes, worldsheets , supersymmetry …. and, strangest of all, the colossal tree of string theory”. What? String theory, supersymmetry and brane theory are theories of particle physics, not cosmology. While they may have been used to some extent by Stephen in his research, it is ludicrous to suggest that they were launched by his work! "In our view, there is no picture or theory-independent concept of reality. Instead we adopt a view that we call model - dependent realism: the idea that a physical theory or world is a model (generally of a mathematical nature) and a set of rules that connect the elements of the model to observations. According to model - dependent realism, it is pointless to ask whether a model is real, only whether it agrees with observation. If two models agree with observation, neither model can be considered more real than the other. A person can use whichever model is more convenient in the situation under consideration." there is no doubt that the theoretical physics community, indeed the world community, has lost an outstanding role model. naivetheorist, I refer this quote from the work of Stephen Hawking to the fundamental and irremovable shortcomings of the current methodology. Any rational model describes a reality with errors. We do not know the scale and nature of an errors of rational approximation. Nevertheless, we can create mathematics without approximation errors. Mathematics without errors of approximation will describe the properties of material reality. Material reality is a fragment of the information field. The information field has full entropy. We cannot materialize any information designs. The entropy of material reality is a fragment of the information field's entropy. We must solve the task of localizing this fragment. We must find a universal mathematical solution for any real models. We cannot find this solution with the help of rational methodology. Material reality is not rational in its entirety. We must and we can create a new paradigm.